I think this is a fantastic way of introducing some of the central concerns in Sanders's approach to the Historical Jesus. It has a resonance with our students too because it is filmed here at Duke. I really like this piece. I am sympathetic with what he says about Jesus' "matrix", and especially avoiding the term "background". This goes back at least to Geza Vermes's insistence, in Jesus the Jew in 1973, that we avoid seeing historical materials as "background" to the New Testament and instead think of them as witnesses. I don't think the term "matrix" can ever quite catch on in this context, though, given the way that it makes us think of The Matrix. But perhaps James McGrath would disagree and perhaps today's students are not as familiar with The Matrix as students were a decade ago. Religion Online is back. It turns out that it wasn't gone for good. Over on the Bible Films Blog, Matt Page has an enjoyable post about The Ideological Convenience of Q. He expresses well something I hinted at in the first chapter of The Case Against Q. If we were to dispense with Q, it would not be without tears. For Q has been all over the world, loved by everyone, feminists and liberation theologians, the sober and the sensational, the scholar and the layperson, a document with universal appeal. Indeed one of the keys to its success has been its ability to woo both conservatives and radicals alike. While conservatives, for example, are drawn by its early witness to sayings of Jesus, others have seen its lack of a Passion Narrative as witnessing to an alternative stream of early Christianity, one not based on the proclamation of a crucified Christ. For those at one end of the theological spectrum, Q can give us a document of Jesus material from before 70, written within a generation of the death of Jesus. For those at the other end of the spectrum, Q aligns itself with the Gospel of Thomas to form a “trajectory” in early Christianity that contrasted radically with emerging orthodoxy, and which only “canonical bias” can now obscure from our view (The Case Against Q, 16-17). In general, though, I am disinclined to spend too long worrying about possible ideological underpinnings of theories. In the end, it's the truth that counts and I would rather spend an afternoon in the company of the Synopsis, working with the data, than an afternoon speculating about the the ideological motivations of the scholars. Incidentally, that line "all over the world, loved by everyone" comes from Laurel and Hardy, "Beau Hunks", but I doubt that anyone spotted the subtle allusion. Sadly, the degree of overlap between those who love Laurel and Hardy, and those who love the Synoptic Problem is small. Leonard Greenspoon, Department of Theology, presents "Codex Sinaiticus, The World's Oldest Bible: What It Is All About and Why Is It So Important?" Codex Sinaiticus is a fourth century Greek manuscript that provides the oldest surviving text of the complete Christian Bible. For the Old Testament, the text is the Greek translation called the Septuagint. We will look at this manuscript in terms of its origins and also chronicle the exciting (if also at times, frustrating) story of its modern discovery. We will explore what can be learned of its use over the centuries and what it tells us about the transmission and translation of the Bible from antiquity until the modern period. We will also see how modern technology allows us all to view this treasure--as a work of art and, for many, as a source of inspiration--from our own computers. Joslyn Art Museum in partnership with Creighton's University College, presents a sixth season of stimulating lectures by Creighton faculty. Held in Joslyn's Abbott Lecture Hall on select Sundays at 2:00 pm, CU atJoslyn presents a variety of topics and interdisciplinary perspectives on Joslyn's collections or exhibitions. CU atJoslyn is free with regular museum admission for general public, and always free for Museum members and Creighton students and faculty with ID. NT Pod 48: Why Study the Historical Jesus? The latest episode of the NT Pod came out earlier this week and the topic this time is Why Study the Historical Jesus?. 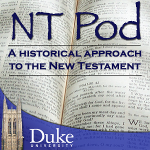 It is at the beginning of a series of podcasts on the Historical Jesus that I hope to run alongside my course on the Historical Jesus at Duke this semester. Has Religion-Online gone for good? One of the oldest and most useful sites in our area, Religion Online, appears to have vanished from the net. The site was a repository of hundreds of online articles and books, lots by the giants of the discipline. It was a no-frills, what-you-see-is-what-you-get, basic text kind of set up. I hope it has not gone for good. Luckily, the files are retrievable from the internet archive, e.g. this is one of the most recent archives: Religion Online (Internet Archive). The site appears not to have been updated since 2008, so it may be that its author has simply ceased maintaining it and that the domain name has gone. Then don't miss Sunday from 9 January when a whole episode was devoted to the King James Bible. It includes interviews with the Archbishop of Canterbury and Ed Kessler and Simon Gathercole. As always with Sunday, it is available as a podcast. Also worth catching is a discussion on Beyond Belief on 3 January on Translation and this one you can get as a podcast. It is a discussion of translation more broadly but the catalyst is the King James Bible anniversary. Lots to enjoy there, but the series is the top priority -- well worth a listen. Don't you just love Radio 4? As regular readers may remember, I like to honour the birthday of Albert Schweitzer on January 14 1875. As it happens, this often falls just when I am teaching the class on Schweitzer in my Historical Jesus course. I am going to be talking about the great man and his legacy next Wednesday, when I hope to use a few clips from the web, which I will also blog here. Next, there is a short one minute celebration of Schweitzer's life on History.com. Third, a remarkable French piece featuring a fairly lengthy interview with Schweitzer (in French) from dailymotion.com: Video Docteur Albert Schweitzer. It is apparently from 1961 and the quality is very good. At about eight minutes in, you can watch the eighty-six year old Schweitzer playing the piano. One delightful thing about this footage is that there is a lot of humour -- Schweitzer comes across as a warm, friendly and funny person. Watch all the way to the end to see him waving at the camera as it departs in a boat. NT Pod 47: Did Jesus Exist? The first episode of the NT Pod in 2011 came out last night and it is headed "Did Jesus exist?" It is a short series of reflections on the so-called "mythicist" case with specific reference to two mythicists I have met, George Wells and Timothy Freke. I first met Tim on Channel 4's Right to Reply, in 2001, when he had recorded a piece critical of the BBC's Son of God (Jesus: The Complete Story in the USA). His piece criticized the BBC for not tackling the mythicist case head-on, and the article also featured short critiques of the series from Tom Wright and Judith Lieu. I was in the studio with Right to Reply presenter Roger Boulton, co-producer of Son of God Michael Wakelin and Timothy Freke. I also reflect briefly on an earlier appearance on Right to Reply, back in 1984, when I was just 17. I was responding to the series Jesus: The Evidence, which featured several scholars of interest -- Geza Vermes, Helmut Koester, Dennis Nineham, Morton Smith. I was a precocious schoolboy and I recorded my little piece in the "video box" in Charlotte Street in London and was amazed when they decided to include it in the programme the next day. The video clip is long since lost (thank goodness), but the series itself survives in several scratchy Youtube versions, which I have blogged about on several occasions (previous blog posts on this series here). It looks peculiarly dated for something not that old, but it retains a real fascination for me. As far as I know, it is the only series ever to provide mini-reconstructions of the life of Rudolf Bultmann. Anyway, the first episode of Jesus: The Evidence featured George Wells (Youtube excerpt of the Wells segement here) and I discuss that in the latest podcast. Twenty years later, I got to meet George Wells in London when he graciously came along to listen at a lecture series day in London which I shared with John Barton and John Muddiman. I greatly enjoyed our chat. Wading into an area like Jesus mythicism is, of course, a risky business, but I think it is worthwhile, not least because it is something that can keep Historical Jesus scholars honest. I think it helps us to reflect too on the nature of ancient history. This episode came about because I am about to begin teaching my course on the Historical Jesus this week, and it's a topic that will be in my thinking. How do I get the Greek New Testament on my Android Device? It's the kind of question that you might see on a techie blog, like Mark Hoffman's Bible Studies and Technological Tools and it is the kind of question that could hardly have been less interesting to me until this week. But this week I finally entered the twenty-first century and got myself a smartphone. As a committed Logos user, I did know that they did not yet have anything for Android devices, though something is planned but what was I to do in the mean time? Mark Hoffman's post Bible Software for Android came just in the nick of time. The place to go is Olive Tree Bible Software. I must admit that I hadn't visited Olive Tree for years. But they are the place to go if you have an Android phone. It's pretty straightforward. I just went to market place on my phone, looked for Olive Tree, found their "KJV Bible Reader", downloaded it and then went, within Olive Tree, to "Browse Online Book Store". Now here's the trick. It's easy to think that the only option is to pay $35.99 for a Greek NT (NA27), and I couldn't find any other option in the "Bibles" section or in the "Greek and Hebrew" section. But I knew that Olive Tree had the SBL Greek New Testament because Mark Hoffman had told me so. And the place to look is in "Free Books". It takes seconds to download, and is just the kind of thing you want on your phone, i.e. when you are on the go. Back in the study, there are the books and there is Logos. But Olive Tree's reader and the SBL Greek NT is just what I wanted when out and about. Be less nice: I need to be much less nice. I notice that other academics focus on their own careers, they ignore emails, or they default to "no" every time. They look after number 1. In recent years, I have spent far, far too much time trying to be kind, collegiate and helpful. A couple of years on and I think I may have failed. My productivity is still not as high as it should be and I still find myself saying Yes to too many things. So I am wondering whether it is time once again to make the all important academic's New Year's Resolution to be a bit less nice in 2011. On the other hand, there are some really nice people who are also really productive. Think of Michael Bird, for example. You couldn't find a nicer chap if you tried. Not could you find a more prolific writer. And, come to think of it, Graham Stanton was a role model for how to be a kind, approachable academic and he wrote lots of good stuff too (see On Scholarly Conduct). So it looks like there is no connection between meanness and productivity. Perhaps the answer is just to become a proper workaholic. That might do the trick. So, resolution for 2011: work harder, sleep less, spend less time with other people, write more. Happy new year, everyone! A trip to England for Christmas took me away from the blog for a while, and the return to work (i.e. ploughing through the email mountain) has kept me away from it for a little longer. I have been paying scant attention to the blogs, so the latest Biblical Studies Carnival by Joseph Kelly is a really useful way of catching up. It's a superb achievement of clarity and comprehensiveness. Meanwhile, all sorts of things are going on in relation to the Biblioblog Top 50 and I have not yet found the time to work out what is what. All I can say is that if NT Wrong is involved, then I am in. I sometimes wonder whether solo-blogging would have been the way to go. Larry Hurtado is one who does a great job of it, and he reflects now on his first few months at it. After all, who can keep up with hundreds and hundreds of blog posts every day? And that's just in Jim West's blog. But recently, it seems that James McGrath is looking to emulate Jim's rate of posting. I hate to say it, but I find myself spending a little less long on each of his posts. I suppose that it is a law of the blogosphere: the higher the number of posts in a given blog, the less attention each one gets. I shouldn't worry, though. I have recently, finally got hold of a smartphone and now I can check the blogs wherever I am. If that takes me away from what I really want to be doing, like watching the cricket on my phone, or following reviews of the Doctor Who Christmas special, I can spend a bit of time with Bible Software for Android while I wait for Logos for Android, which is "coming soon".